The southern area of South Tyrol encompasses the very best of natural alpine scenery and Mediterranean ambiance; making it one of the most popular hiking destinations in the continent. The trails themselves offer the opportunity to wind through lush meadows, past glacial lakes and mountain ranges and through dense forests; and the cities, towns and villages in the region offer plenty in the way of culture, history and fine cuisine. South Tyrol’s South has hiking routes suitable for walkers of all abilities. There are plenty of short trails on undemanding terrain and many challenging routes for more experienced hikers to get their teeth into. With a formidable reputation in wine making, a fascinating history and plenty to see and do for people or all ages, it’s unsurprising that the region is so popular. The landscape encompasses the best of both worlds; picturesque alpine hills and meadows, and dramatic mountainous terrain. As a result, hikers can expect to enjoy a diverse selection of trails, from easy strolls along winding riversides, to lengthy treks through the Dolomites. 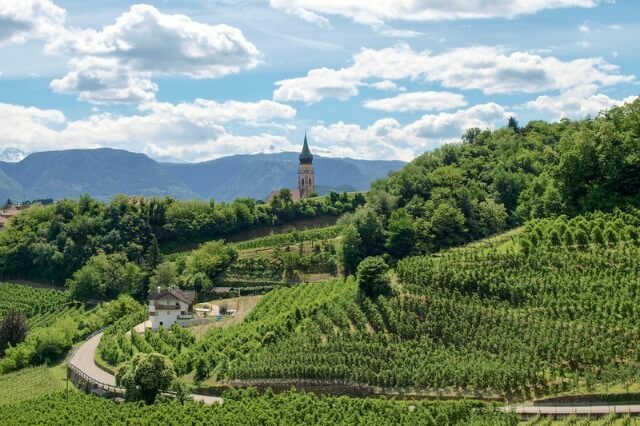 The South Tyrol Wine Road Route is also a popular choice, incorporating visits to some of the region’s finest wine producers, or for visitors searching for a really challenging experience, the Via Ferrata Tomaselli, which involves rock-climbing with guided ropes, provides excitement and adventure. It also offers excellent uninterrupted views from the open rock face on the top section. If you’re looking for a brief break from the great outdoors, you’ll be pleased to know that there are plenty of things to do in Southern South Tyrol, regardless of the weather. The city of Bolzano, with its Germanic ambiance and beautiful 17th century Baroque architecture, contains plenty of museums, churches and restaurants to keep the family amused, and a real highlight is a visit to the South Tyrol Museum of Archaeology in the city of Bozen (Bolzano), to see their most famous resident; the 5,000 year old ice-man, Ötzi! Alternatively, just outside Bolzano, the Messner Mountain Museum is well worth a visit. Created by the famous mountaineer, Rheinhold Messner, it provides fascinating insight into mountaineering. South Tyrol is famous for its castles, and if you’re interested in discovering more about the important families and nobility that once inhabited the area, it’s a good idea to set aside some time to visit them. There are a number of historic castles to explore in the region, such as the castles of Corba, Boymont and d’Appiano, which are all incorporated on the Three Castles trail. The Hocheppan Castle, in the district of Eppan, originates from the 12th century and is considered one of the most significant castles in the region. Southern South Tyrol boasts a warm, Mediterranean climate, with temperatures soaring to over 30˚C in July and August. However, the mountains are often considerably cooler, making this a popular time of year for hikers, especially as all the cable cars are in operation. Spring and Autumn are also pleasant times to visit. The temperatures dip slightly (to a more comfortable 15˚C to 25˚C) and accommodation is often cheaper at this time. The easiest place to get to in Southern South Tyrol is Bolzano (Bozen), which is well served by both train and bus. There are two international airports in the near vicinity, Innsbruck in the north, and Verona in the south, and both are approximately 2 hours away by road or train. If you’re arriving by car, the region is equally easy to get to, and there are many motorways close by. Locations are well signposted throughout.